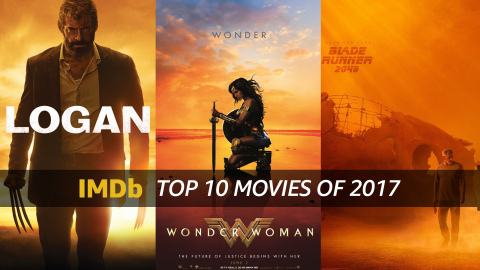 SEATTLE--(BUSINESS WIRE)--IMDb (www.imdb.com), the world’s most popular and authoritative source for movie, TV and celebrity content, today unveiled the Top 10 Movies of 2017 and the Top 10 Most-Anticipated Movies of 2018. Rather than base its annual rankings on small statistical samplings or reviews from professional critics, IMDb determines its list of most popular movies by the actual page views of the more than 250 million monthly unique visitors to IMDb. This exclusive data is derived from IMDbPro’s definitive MOVIEmeter rankings, which are updated weekly throughout the year. Additionally, IMDb today revealed IMDbPro’s Top-Grossing Domestic Releases of 2017 (as of December 18, 2017). IMDb’s Best of 2017 section features a variety of additional year-end Top 10 lists as well as retrospective photo galleries, trailers, original videos (including an upcoming In Memoriam video) and other year-end coverage. To visit IMDb’s Best of 2017 section, go to: http://www.imdb.com/bestof. *Among the movies released in the U.S. in 2017, these 10 movies were consistently most popular with IMDb users as determined by the actual page views of IMDb’s more than 250 million monthly unique visitors worldwide. This exclusive data is derived from IMDbPro’s definitive MOVIEmeter rankings, which are updated weekly throughout the year. IMDb users can add these and other titles to their IMDb Watchlist. To learn more, go to: http://www.imdb.com/watchlist. *Among the movies with planned releases in the U.S. in 2018, these 10 movies were consistently most popular with IMDb users as determined by the actual page views of IMDb’s more than 250 million monthly unique visitors worldwide. This exclusive data is derived from IMDbPro’s definitive MOVIEmeter rankings, which are updated weekly throughout the year. IMDb users can add these and other titles to their IMDb Watchlist. To learn more, go to: http://www.imdb.com/watchlist. *As of Dec. 18, 2017, these 10 movies had the highest domestic box-office grosses during the 2017 calendar year, according to IMDbPro’s box-office reporting service, Box Office Mojo. Additional insight into trending movies, TV shows and professionals is available to IMDbPro (http://www.imdbpro.com) members through its exclusive STARmeter and MOVIEmeter rankings. This data is updated weekly on both the IMDbPro site and its recently launched iPhone app. IMDbPro, a membership-based service, includes comprehensive information and tools designed to help entertainment industry professionals achieve success throughout all stages of their career. IMDbPro offers members the following: detailed contact and representation information; tools to manage and showcase their IMDb profile, including the ability to select their primary images and the credits they are best “known for”; exclusive STARmeter rankings determined by page views on IMDb; a casting service to post breakdowns and apply to roles; the new IMDbPro app for iPhone and more. The IMDbPro app for iPhone enables members to conveniently access the entertainment industry’s leading information resource on the go. The IMDbPro app is exclusively available for use by IMDbPro members and can be downloaded for free in the App Store. To become a member today, visit www.imdbpro.com. IMDb is the world’s most popular and authoritative source for movie, TV and celebrity content. The IMDb consumer site (www.imdb.com) is the #1 movie website in the world with a combined web and mobile audience of more than 250 million unique monthly visitors. IMDb offers a searchable database of more than 250 million data items including more than 4 million movies, TV and entertainment programs and more than 8 million cast and crew members. Consumers rely on the information IMDb provides — including local movie showtimes, ticketing, trailers, critic and user reviews, personalized recommendations, photo galleries, entertainment news, quotes, trivia, box-office data, editorial feature sections and a universal Watchlist — when deciding what to watch and where to watch it. IMDb’s portfolio of leading entertainment apps (http://www.imdb.com/apps/) includes its popular “Movies & TV” app for iPhone, iPad, Kindle Fire, Android phones, Android tablets and its mobile-optimized website. To date, there have been more than 150 million downloads of IMDb’s mobile apps worldwide. IMDb's X-Ray for Movies & TV Shows (www.imdb.com/x-ray) is a feature that revolutionizes the viewing experience by bringing the power of IMDb directly to Kindle Fire HD, Fire TV and Fire TV Stick. IMDb’s Facebook page (https://www.facebook.com/imdb) and official Twitter account (https://twitter.com/imdb) are followed by more than 12 million passionate entertainment fans. IMDbPro (http://www.imdbpro.com) is the essential resource for entertainment industry professionals. This membership-based service includes comprehensive information and tools that are designed to help entertainment industry professionals achieve success throughout all stages of their career. IMDbPro offers members the following: detailed contact and representation information; IMDb profile management tools; exclusive STARmeter rankings that are determined by page views on IMDb; a casting service to post breakdowns and apply to roles, a mobile optimized website and more. Additionally, IMDb owns and operates Withoutabox (http://www.withoutabox.com), the premier submission service for film festivals and filmmakers, and Box Office Mojo (http://www.boxofficemojo.com), the leading online box-office reporting service. IMDb.com is operated by IMDb.com, Inc., a wholly owned subsidiary of Amazon.com, Inc. (NASDAQ:AMZN) (http://www.amazon.com). To learn more, go to: http://www.imdb.com/press.